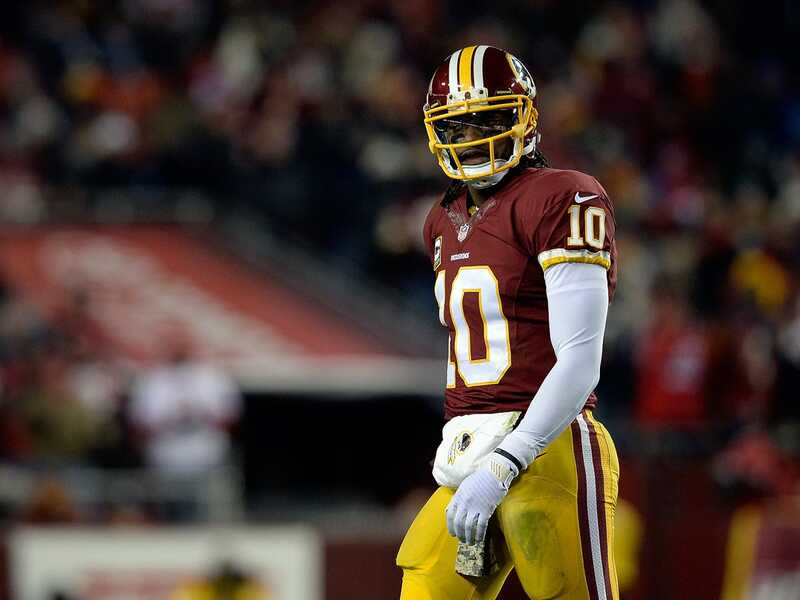 The Washington Redskins have a big decision to make on Robert Griffin III this offseason. Griffin is signed through 2015 at a modest $US3.2 million. The Redskins have a team option for a contract extension that would keep him on the team in 2016, but they’d have to pay him around $US18.4 million guaranteed, ProFootballTalk reports. The problem is that the team must decide whether or not to sign him to the extension by May of 2015, according to PFT. That means they won’t have another year to gauge his development. 2014 is going to be a lost year for Griffin. He dislocated his ankle in Week 2, missed six games, and is 0-3 since he returned. His coach, Jay Gruden, has turned on him in the media — saying RGIII has been “coddled” and that the “clock is ticking” to prove himself as a starter. 2013 was also something of a lost year. He ended up starting in Week 1 despite the fact that he suffered a devastating knee injury just nine months earlier. He barely participated in training camp and Redskins GM Bruce Allen eventually admitted that this was a mistake, saying Griffin should have waited until he was fully recovered to start playing in games. Griffin was fantastic in 2012. But that was two years and two major lower-leg injuries ago. The coaching staff and offensive scheme are both different. Because of those injuries and internal turmoil, Griffin hasn’t had the chance to incrementally develop that way quarterbacks normally do since the team drafted him in 2012. The Redskins have to make a decision on 2016 without really knowing the type of player Griffin is going to be. The rational move seems to be to decline the extension, pay him $US3.2 million in 2015, and then try to re-sign him in free agency in 2016 if it looks like he’s turning things around. But then you run the risk of letting him leave for nothing at age 26 — which would be a hard pill to swallow considering the enormous number of draft picks they gave up for him.